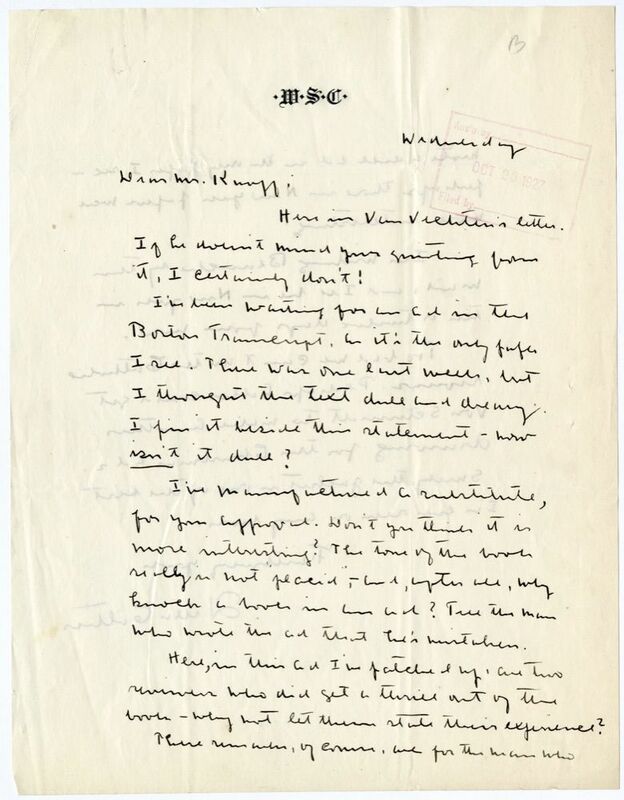 Here is3 Van Vechten's4 letter. If he doesn't mind your quoting from it, I certainly don't! I've been waiting for an ad5 in the Boston Transcript6, as it's the only paper I see. There was one last week, but I thought the text dull and dreary. I pin it7 beside this statement—now isn't it dull? I've manufactured a substitute, for your approval. Don't you think it is more interesting? The tone of the book8 really is not "placid",—and, after all, why knock a book in an ad? Tell the man who wrote this ad that he's mistaken. Here, in this ad I've patched up9, are two reviewers who did get a thrill out of the book—why not let them state their experience? These remarks, of course, are for the man who wrote a dull ad in the only paper I see—perhaps those in New York10 papers were more interesting. I'm writing Blanche11 by this mail, and I'll be in New York in ten or twelve days from now. Too bad we can't use the Catholic reviews12. Perhaps Adler13 could get Von Schmidt14 to make another drawing for the Christmas ads. Surely, the jacket15 is one of the best I've ever seen on any book. October 19, 1927 is the Wednesday before this letter was stamped as received on October 20, 1927. 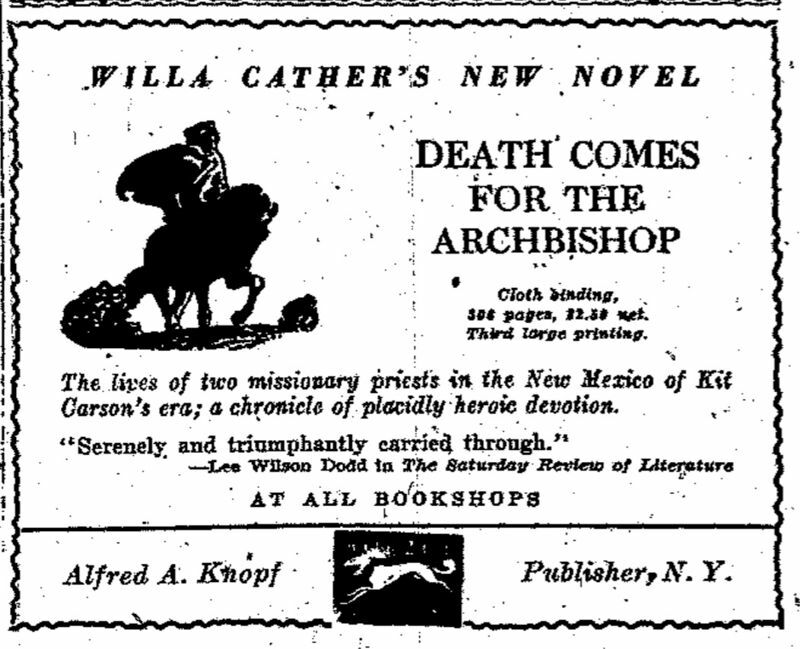 On 17 October 1927 Knopf wrote to Cather asking if she would send him a letter Carl Van Vechten sent her about Death Comes for the Archbishop. Small holes are visible in the original where Cather fastened the clipping to the letter with a straight pin. The clipping has not survived. Cather evidently pieced together quotations from reviews as a suggested advertisement, but the enclosure does not survive. 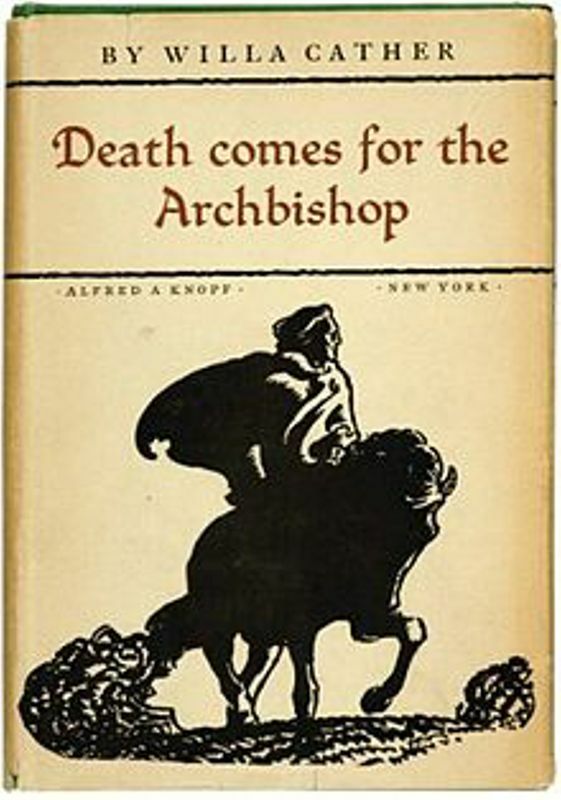 The dust jacket of the first edition of Death Comes for the Archbishop (1927). 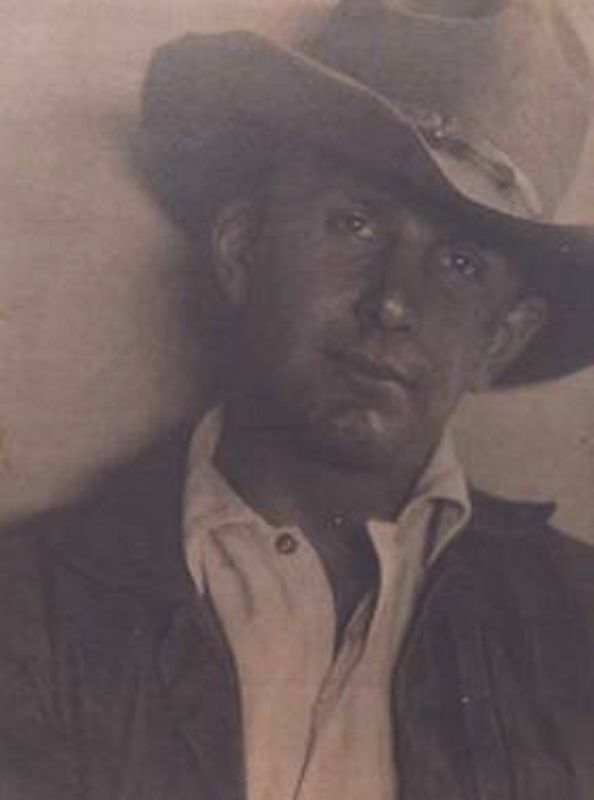 Van Vechten, Carl (1880-1964). American novelist, critic, and photographer. 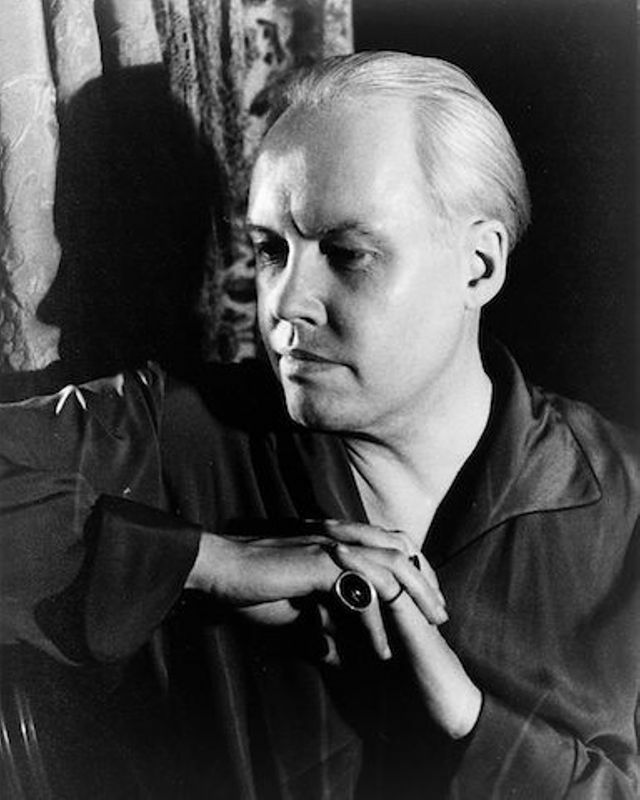 Born in Cedar Rapids, IA, Carl Van Vechten graduated from the University of Chicago in 1903. After a stint at a Chicago newspaper he moved to New York City in 1906 and became assistant music critic for the New York Times. Immersing himself in the life of Greenwich Village, he met Willa Cather and attended the famous salon of Mabel Dodge (later Luhan). 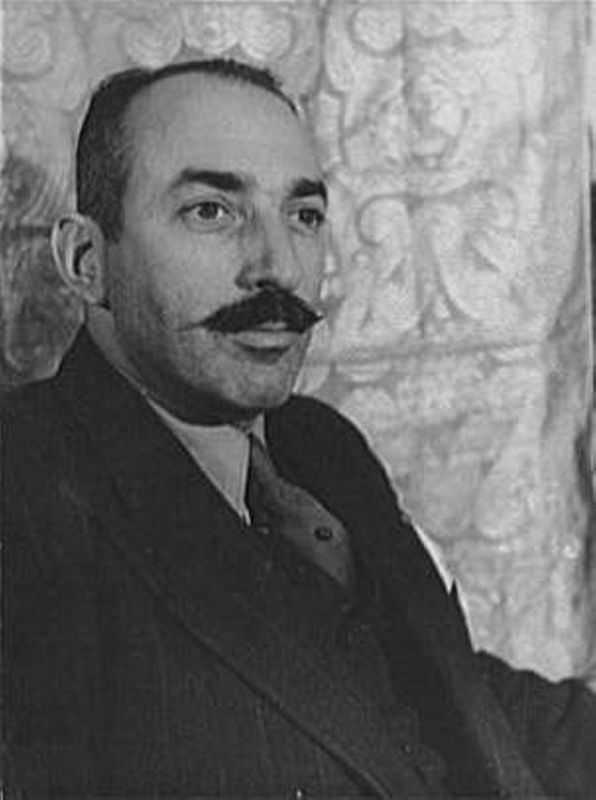 Van Vechten left full-time newspaper work in 1914 but continued championing the modern and avant garde in the arts. He advocated for the works of Gertrude Stein, who made him her literary executor, and became an important patron of the Harlem Renaissance. Van Vechten’s first marriage ended in divorce in 1912 and in 1914 he married actress Fania Marinoff, but throughout his life he also had affairs with men. 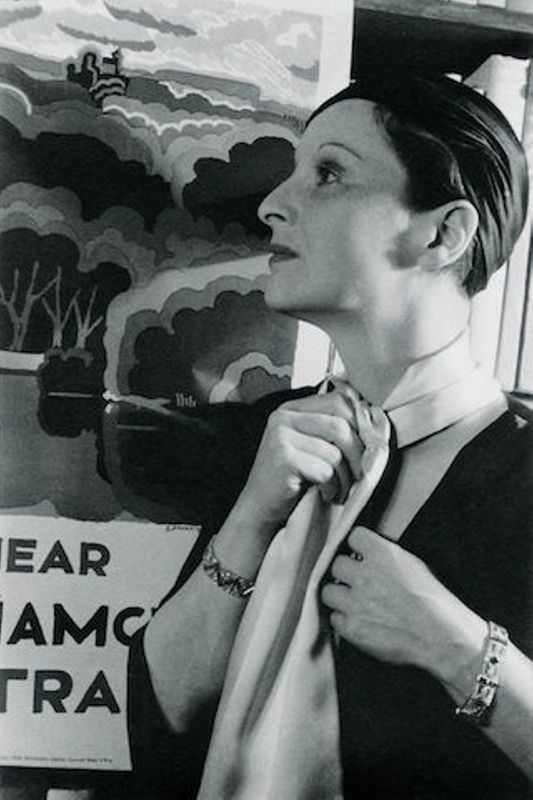 In the 1930s, he began pursuing photography professionally, specializing in portraiture. After three years of evading him, in 1936 Cather finally sat for a portrait by him. During World War II, Van Vechten was active in the Stage Door Canteen and the American Theater Wing. He remained an active photographer and presence in New York’s cultural life until his death. Adler, Elmer (1884-1962). American printer, publisher, editor, and author. After moving from Rochester, NY, to New York City, Adler founded the Pynson Printers in 1922. 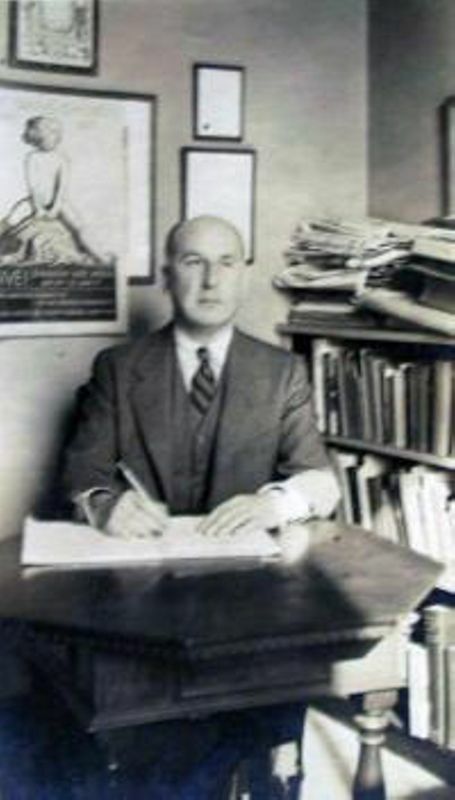 He also became a partner in Random House in 1922 and founded the Colophon: A Book Collector’s Quarterly in 1930. Adler’s Pynson press produced deluxe limited editions of April Twilights and Other Poems (1923) and December Night (1933) (an excerpt from Death Comes for the Archbishop). He also designed the edition of Death Comes for the Archbishop illustrated by Harold von Schmidt (1927), the title page for My Mortal Enemy (1926) and the title page and dust jacket for Shadows on the Rock (1931). 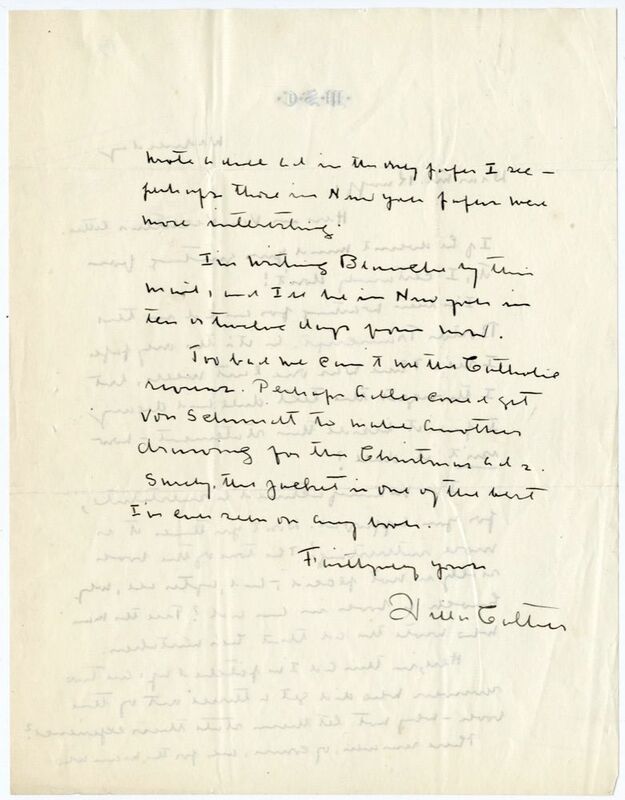 Adler approached Cather in 1929 about contributing to a planned series in the Colophon on “Getting into Print”; her essay “My First Novels (there were two)” finally appeared in 1931. In 1940, Adler established the Department of Graphic Arts at Princeton University, where he remained until 1952. He then moved to Puerto Rico to establish La Casa del Libro, with which he was associated until his death.